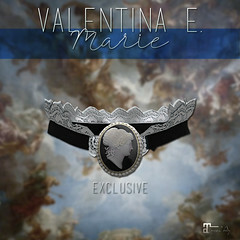 March 2018 – Valentina E.
NEW! Valentina E. For Pocket Gacha! NEW! Valentina E. Isabella Lace Gown @ The Fantasy Collective! Out now at The Fantasy Collective our new Valentina E. Isabella Lace Gown! There are loads of ways to wear this dress with optional puff sleeves, and an on/off lower skirt and lace train! Available in four color options for Belleza Freya/Isis, Slink Physique/Hourglass, and Maitreya Lara only at this special event. NEW! 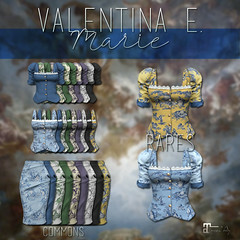 Valentina E. Julia Dress @ FaMESHed! Out now at FaMESHed the new Valentina E. Julia Dress! Featuring a ballet style top with a layer skirt and featured in five color options. Find it in Belleza, Slink, & Maitreya sizes only at this special event.